Founded by Mansfield Davis, for over a half century these offices have been dedicated to providing the highest quality of personal representation in state and federal trial and appellate courts to those who have suffered injury upon the high seas, or the navigable waters of the United States. We provide legal services to merchant seamen, longshoremen and harbor workers, recreational and professional fishermen, boaters, divers, and crew and passengers of cruise ships. We also provide legal representation to persons in general civil litigation matters including motor vehicle accidents, premises liability, public entity liability, discrimination, wrongful termination, insurance disputes, and civil rights violations. ﻿﻿﻿﻿John J. Hughes﻿﻿﻿﻿ is a member of the State Bar of California and a Certified Specialist in Admiralty and Maritime Law. He is a member of the California State Bar Advisory Commission on Admiralty and Maritime Law. He also maintains memberships in the American Association for Justice, the Consumer Attorneys of California, the Bar Association of San Francisco, and the San Francisco Trial Lawyers Association. By temporary admission and the association of local counsel, the firm provides representation in maritime matters throughout the United States and worldwide. 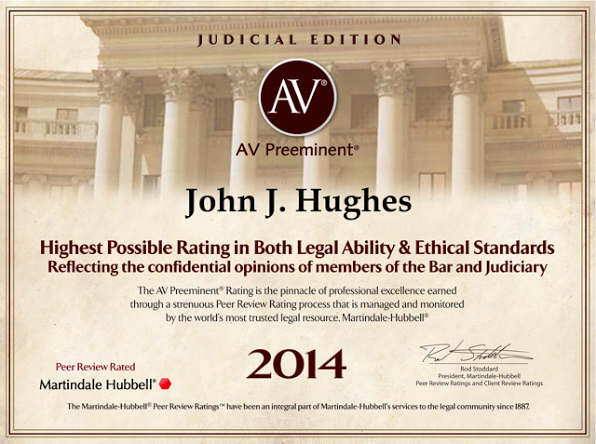 John has been peer review rated as preeminent in his field in both ethics and professional ability. Visit the ﻿﻿Our C﻿ases﻿﻿ page to see some representative cases, both maritime and non-maritime. Visit our Links page - it will point you in the direction of some of the most interesting and useful sites on the internet dealing with various legal and maritime subjects. Visit our Admiralty Law page and learn more about the law of admiralty and some of the ways it is different from other areas of the practice of law.